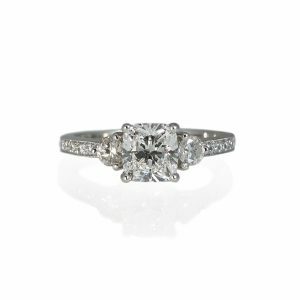 The technical term for cushion cut diamond is Cushion Modified Brilliant. 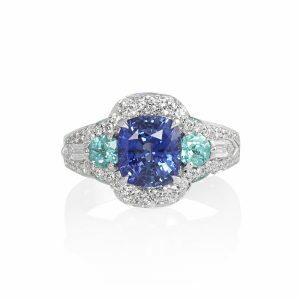 It has the facets of a brilliant cut but in a cushion shape. It’s a shape that works well for most hand structures. It’s also great if your finger tips are slightly curved and if you want a little more length than a round brilliant cut offers. 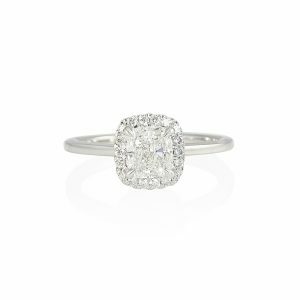 Cushion cut diamonds have the characteristics of round brilliant cut diamonds – they will show color but they won’t show inclusions as easily. 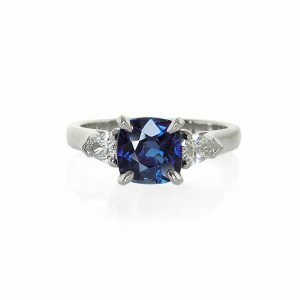 It’s up to you which one of the 4 C’s is more important, however, you have a certain budget to spend and if you are looking for a larger diamond, you can go slightly lower in clarity as long as the inclusion is not eye visible but don’t sacrifice color. 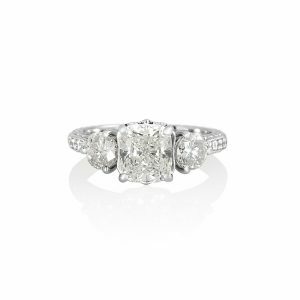 As you can see from the image above, cushion cut diamonds come in different proportions and shapes. Some are more elongated, such as the first one on the left, some are a perfect cushion shape, such as the first one on the right, and some have a more square shape, such as the second one from the right. 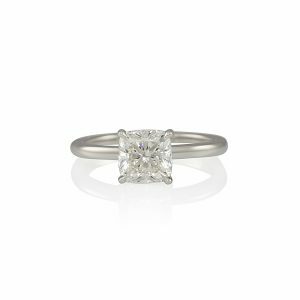 Unlike emerald cut diamonds where a 1.4 length to width ratio is the ideal proportion, cushion cuts are subjective and it’s really what looks suitable for your hand. For example, a rectangular shape cushion cut diamond would look more suitable on an elongated hand. Where as a perfect cushion shape and one with a more square shape would look better on a fuller hand. 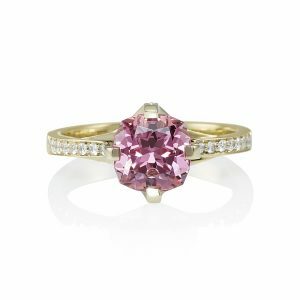 Based on your hand structure, I will bring in suitable shape cushion cut diamonds with different color, clarity and carat weight so you can choose from. Regardless of the shape, one aspect I never sacrifice when bringing diamonds is their fire. 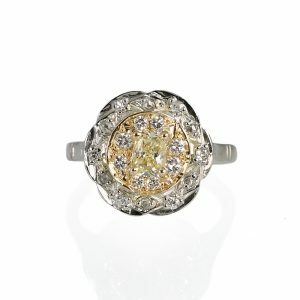 Any suitable shape that I choose and bring in, will definitely have the most beautiful sparkle.